One of the best parts of our angling pastime is the amazing scenery that we often enjoy. The top fishing spots are usually out-of-the-way, hard-to-find, “secret fishing holes” that are far from the beaten path. We enjoy the solitude, even if it takes us hours to get on location. So in mid-June, my fishing adventure was a bit out of the norm. My fishing buddy Tom and my son Steve met me at a dock in a very urban setting. We parked in a small lot, shaded by an overpass, and walked down to the dock to meet our guide. We were within an area of at least half a million people, and lots of houses, motels, shopping centers and all the other accouterments of our species. Cars zipped overhead as we climbed onto the big aluminum sled captained by Rob Crandall, owner of Water Time Outfitters. We had fished with Water Time before. Steve and I spent a great weekend with Gill, Rob’s guide in central Oregon, casting flies to the big redside trout on the Deschutes River. That trip featured fun in the desert with almost no company. But today was a very different fishery. We jumped into the sled, gunned the motor upstream for maybe a minute, and then Rob guided us into a series of cliffs, with water cascading everywhere. On this day we were going to try to collect some of the bounty charging up the Willamette River. 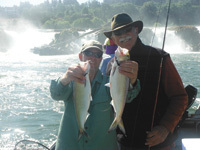 Right in downtown Oregon City, a few yards off of Highway 205, is an amazing fishery. The river flows down over nearly half a mile of falls, and the fish, many coming in from the Pacific, up the Columbia and then south a few miles to the Willamette Falls, are kegged up by the thousands. We anchored the boat in a few feet of water, with a fine mist of spray to keep us warm, and pulled out the five-weight fly rods. In the waters flowing by were schools of spring salmon, summer steelhead, huge sturgeon, and many thousands of our fish of the day, American shad. Shad are one of the dominant fish coming up the Columbia, with runs of over seven million, and they are a hugely successful species. Brought over from the East Coast with striped bass over a hundred years ago, they have done extremely well. They now fill the waters that feed San Francisco Bay, and those flowing into the Columbia, with millions of bright, shiny fish. Since there is virtually no commercial fishery for them, and they get relatively little pressure from anglers, they feast in the ocean and then return in giant schools to spawn in their home waters with little predation. They are nothing short of wonderful on the line! Plankton eaters, they readily strike small spinners and the little sparkly flies that Rob had tied for us. On my second cast, I retrieved a little line and a fat shad hammered the fly and shot into the air! Sometimes called the “poor man’s tarpon,” the largest of the herring family is great fun on a fly rod. Soon, Tom was onto a fish, and for the next four hours we caught fish after fish. Huge schools of shad, most in the two- to four-pound range, moved up and down the river. When they stuck their noses up our direction, we would get strike after strike. The fish have mouths designed for feeding on small organisms and many of the spots behind the lips feature soft tissue, so you have to figure you are going to lose a few. In fact, Tom started out “releasing” a half-dozen or so while they were still thirty feet from the boat! But nothing to worry about, we often had two or even three lines full at once, so you didn’t have to wait long to get back in the game. Keeping things interesting were the occasional salmon or steelhead that would take a notion that the fly might be fun to strike. A few days earlier, one of our buddies from the fly club had landed a 10-pound chinook right where we were parked, and an angler fishing just above us was battling a nice salmon when we first arrived. Need something a tad bigger? On occasion, the fly will nest in the maw of a huge sturgeon. We saw several jumping and rolling within fifty yards of our boat that were well over six feet, some much bigger. All were as fat as barrels. With thousands of bright shad filling the waters, they had an awful lot of easy meals swimming around—fast food for sure! Most of Rod’s shad fishermen release all of their catch. The fish have a lot of bones and are a bit of work to prepare. They are, however, very tasty and were a very popular fish in Colonial times. John McPhee has written a great book, The Founding Fish, extolling the virtues of the humble shad. On the East Coast, the fish spawn all the way from Florida to Canada. Most of those who spawn in the southern ranges die shortly after, but those in the more northern climes usually survive and go back to the salt water, most to the Bay of Fundy, to feed and get fat. McPhee gives the shad credit for the success and survival of the Continental Army. Washington’s troops were starving at Valley Forge. Lucky for them, a huge bunch of meals were swimming up the Delaware. The British forgot about the run and didn’t blockade the river. But Washington, a commercial shad fisherman himself, was waiting for the oily fish to arrive. When the run reached his army, he had them swim the horses toward the schools and drive them on shore, where they were grabbed and gobbled by his starving troops. Why, if there were no shad, we might all be saluting the Queen! Being true patriots, we kept a lot of fish. (There is no limit on our watershed.) But I come for a long line of Norwegian fish eaters. My grandfather, who taught me how to fish, used to dip for shad in the tributaries of the Sacramento River. He’d go out at night in a small skiff with his neighbors. They used a wire dip net that they stuck into the murky water of the sloughs. When the net “bumped’ a shad, he would lift up the net and throw it on board. When they got home, his buddies had the job of preparing the fish. During the next day, he smoked the entire catch and the whole neighborhood came over to share. One neighbor would bring the bread, another a round of cheese, and someone else some homebrewed beer. During the Depression my grandmother said that everyone ate at their house for as long as the run held out. During the shad season at Grandpa’s house we would enjoy fried shad eggs at Grandmother’s breakfast table and during lunch we always would have some smoked shad. There were a few bones to pick, but the fish tasted great and were well worth the effort. Sometimes, if a neighbor came over, I even got a little beer. No wonder I have always loved shad!